A small city in Henan, Huixian has seen spectacular development thanks to its rich natural resources. Located in the northeast of Central China's Henan Province and adjacent to North China's Shanxi Province, it has been designated as one of Henan's top urban cities and an intellectual property rights promotion experimental city. Covering 2,007 sq km, it has 22 counties and townships and 533 villages with a total population of 800,000. Last year, its total gross domestic product (GDP) reached 9.74 billion yuan. The city has five major investment areas, including the Chengxi, Mengzhuang, Wucun, Zhaogu and Hongzhou industrial areas. Huixian used to be inhabited by the Gonggong Tribe, credited with an old Chinese legend about the creation of man. It was believed that Gonggong was the tribal leader who tore open the heavens which were then closed by Goddess Nuwa, who then created man. In the Zhou Dynasty (c. 11th century-256BC), Huixian was named as Gong State. During the Western Han (206BC-AD24) period, it was named as Gongxian County. It also went by the names Gongcheng during the Sui Dynasty (AD581-618), Gongzhou during the Tang Dynasty (AD618-907), and Huizhou during the Yuan Dynasty (1271-1368). The name Huixian was adopted in 1368, at the beginning of the Ming Dynasty. In 1988, it was upgraded from a county to a city. Huixian is associated with many famous celebrities in Chinese history, including Sun Deng, Shao Yong and Peng Liaofan. Renowned scholars Su Shi, Zhao Zi'ang, Tang Yin and Zheng Banqiao left behind many poems and calligraphy works in the city in ancient times. Some old relics of the Great Wall of the Zhao State during the Warring States Period (475-221BC) have also been found in the city, as also the famous Menzhuang Yangshao Cultural Relics. Huixian extends 25 sq km from the meeting point of the Beijing-Guangzhou and the Xinxiang-Heze railways. To the south, it lies 20 km from the Beijing-Zhuhai Expressway and to the west, it is 20 km from the State Highway 107 and 50 km from the Xinjin and Taijin expressways. The city is located 90 km from the Zhengzhou International Airport to the south and 600 km from Beijing to the north. It is crisscrossed by five provincial-level roads. Huixian boasts unique resource advantage. Eighteen varieties of coal and minerals have been found in Huixian and it ranks first nationwide in coal and sandstone reserves. The forestry cover in Huixian stands at 65,333 hectares, or 24.8 percent of the city's total area, making it a key forestry reserve in the Taihang Mountain Area. The area's herbal plants stands at 3,333 hectares, making the city Henan's important production base for the Chinese herb, radix bupleuri. The city's plateau area is touted as the grain base for northern Henan, and is credited with China's quality wheat production and organic vegetable farming. Huixian is also a wonderful place for tourism, with an astonishing 1,600 scenic spots, covering 187.9 sq km. The top draws are in the 400 km-long Taihang Mountains, including Baiquan Spring, Baoquan Spring, Baiyun Temple and the Wanxian Mountain. Huixian is also home to the endangered macaque. The South Valley of the Taihang Mountain has been assessed as one of the most beautiful places by the China National Geology Magazine. The Guanshan Geological Park and Wanxianshan 4A Scenery Area are all located there. A nitric acid production line. 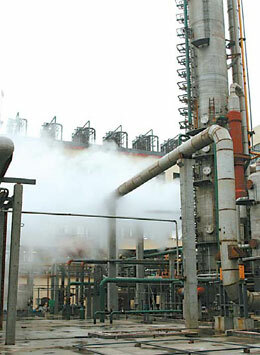 Chemical processing is a pillar industry in Huixian. A total of 18,000 companies have been set up in Huixian. Of them, 27 have annual output value in excess of 100 million yuan and 140 have a significantly large production scale. Energy, construction materials, textiles and machinery are the major industrial pillars. Food, chemicals, paper-making and pharmaceuticals have also emerged as key industries. More than 30 enterprises have independent export rights. 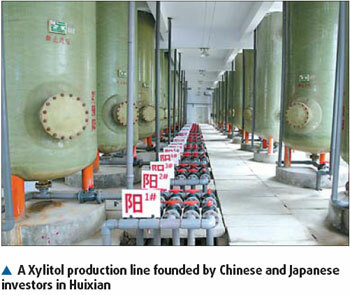 In the past two years, Huixian has become the largest energy base in northern Henan. Its annual coal production stands at 10 million tons and installed electricity generating capacity at 4.5 million kilowatts. In recent years, Huixian has improved its investment climate, attracting many domestic and foreign investors. The State Grid Corp has invested to build four units of 300-megawatt pump storage power stations there. 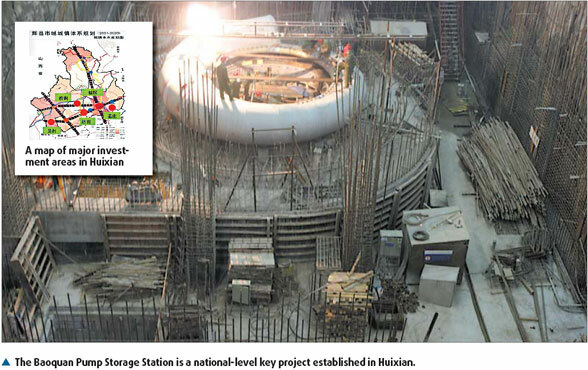 The China Huadian Group has pumped in 4.6 billion yuan to establish two units of 660-megawatt power station. The Coking Coal Corp has poured in 3.5 billion yuan to set up three national-level key projects in the city, including Baoshan Power Plant, Baoquan Pump Storage Power Station and Zhaogu Coal Mine. To date, the city has welcomed a total of 25 foreign-funded enterprises and nearly 100 foreign-investment companies. The city is trying to encourage more investment in resource development and downstream industries, including coal, environmental protection, energy saving, quality textile products, refinery machinery, agricultural products, tourism and hi-tech industries. Apart from national and provincial-level investment policies, the city is committed to providing top-notch service to investors, offering more favorable policies in land-use, water and power supplies and communication. 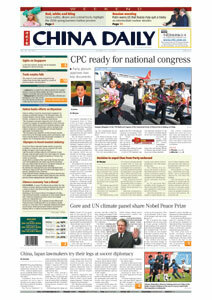 Foreign investors are widely encouraged to participate in the city's industrial development.